IF YOU HAVE SPECIFIC JERSEY IN YOUR WISH LIST, PLEASE LET ME KNOW. I MIGHT BE ABLE TO HELP YOU WITH THAT! PIT-TO-PIT: 20 INCHES / HEIGHT: 28 INCHES. 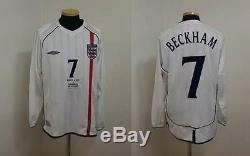 ENGLAND HOME LS BECKHAM SHIRT. NAME NUMBER MADE OF FELT MATERIAL. = Very Bad - Only to play football. = Moderate - Small stains or odd holes. = Very Good - Only few bobbles / pulls. = Excellent - Only 1-2 bobbles / pulls. = BNWOT - Brand new without tag / perfect condition. = BNWT- Brand new with tag / perfect condition. If you are concerned about this issue. CHECK MY OTHER ITEMS ON THE LISTINGS. The item "(M) ENGLAND SHIRT JERSEY LONG L/S BECKHAM MANCHESTER MILAN REAL MADRID V. GREECE" is in sale since Wednesday, June 29, 2016.